Obesity, colorectal cancer, cardiovascular disease and diabetes are diseases of affluence and have replaced infectious diseases as the principal causes of premature death and disability in Australia. In reality, these diseases are a global problem and have a common risk factor – the consumption of highly refined processed foods as the whole food chain becomes industrialised. Dietary fibre is an essential nutrient and recommendations for increased fibre consumption are promoted in the USA and many industrialised and developing countries. In contrast the situation in Australia is different. Apparent fibre consumption is high by international standards yet gut health including high rates of colorectal cancer, is poor ‘ the so-called ‘Australian paradox’. This phenomenon led to a major reappraisal by CSIRO during the 1970s and 80s of the way in which fibre is thought to act in non-ruminants including humans. It led to the discovery of a special type of fibre component called resistant starch. This is starch which escapes digestion in the small intestine and enters the large bowel where it is digested by the microflora. It also led to discovery of the importance of these bacterial fermentation products (short chain fatty acids, particularly butyrate) in promoting gut health. Beginning in the late 1990s CSIRO combined it’s knowledge of the importance of resistant starch in gut health with its expertise in developing new cereal grains with elevated resistant starch levels which could be used to modify existing foods without major changes in processing. BARLEYmax® is the first successful commercial ingredient from this research and development program. It has been on sale in supermarkets in a variety of food products since 2009. The company BARLEYmax Enterprizes Pty Ltd has plans to expand internationally as do the manufacturers of BARLEYmax food products. The research program was awarded a CSIRO Medal for Research Achievement in 2010. Conditions such as colorectal cancer, cardiovascular diseases and diabetes are the major causes of premature death and disability in affluent countries including Australia, the United States and Japan. The consumption of highly refined, fibre-depleted, energy-dense foods has emerged as a dominant contributor to obesity and the increased risk of these conditions. Heritable (ie genetic) factors appear to be a relatively minor component of risk given the rapid appearance of the diseases of affluence in diverse countries undergoing the transition from traditional food patterns to industrialised ones. Prevention through diet and lifestyle change appears to be the best strategy for dealing with these diseases of affluence and increasing the consumption of dietary fibre is one of the key elements in the efforts to contain them. The interest in the health potential of dietary fibre comes largely from the pioneering work of a group of British medical officers working in colonial south and east Africa more than 50 years ago who were struck by the radically different health problems experienced by the native Africans and the Europeans living in the same environment. The native Africans were at greater risk of infectious diseases but were almost free of what they called the â€œdiseases of civilisationâ€. This is diametrically opposed to the situation in the Europeans who were affected much more by non-infectious gut health issues. The physicians saw the clear differences in diet between the two groups. The Africans ate staples made from plant foods including vegetables and whole grains while the European diet consisted principally of highly refined (ie low fibre), energy dense foods. This data laid the foundations for what has become known generally as the â€œfibre hypothesisâ€ where the diseases of civilisation reflect a simple deficiency of this nutrient. Dietary fibre is an essential nutrient and is recognised as such by health agencies in Australia and many other countries. These authorities specify intakes throughout the life cycle to ensure optimal health status. Generally, these recommendations are for increased consumption as, in the USA and many industrialised and developing countries, population-wide intakes are generally considerably below the accepted optimum. The situation in Australia is rather different where apparent fibre consumption is high by international standards. Despite this, gut health including colorectal cancer is poor. In Australia rates of colorectal cancer are amongst the highest in the world and the incidence is rising, especially among younger age groups. This is the Australian paradox of apparently high fibre consumption and high rates of colorectal cancer and other diseases. There is another paradox ‘ that of the Africans whose dietary habits gave us the fibre hypothesis. Application of modern analytical tools to their staple foods show that their â€œfibreâ€ content is actually quite low, certainly lower than the Australian values suggesting their diets have some other health-promoting component. These discrepancies led to a major reappraisal in the way in which fibre is thought to act in non-ruminants, the discovery of resistant starch and the importance of its bacterial fermentation products, short chain fatty acids. CSIRO has a long history of research into dietary fibre from its extensive research on the nutrition of sheep and cattle. Fermentation of forage carbohydrates by the rumen bacteria releases short chain fatty acids (principally acetic, propionic and butyric acids) on which sheep and cattle depend totally to meet their energy needs. CSIRO’s Division of Animal Nutrition had a major focus on developing and understanding the key factors which regulate this fermentation. With the switch from animal to human nutrition, and the appointment of Basil Hetzel as Chief of the redirected Division of Human Nutrition, research into fibre continued and several myths regarding fibre and human health were debunked. Fibre is not digestible by the human digestive system and it was thought that its beneficial actions depended solely on this indigestibility. One beneficial action that is dependent on indigestibility is its promotion of regularity as shown strikingly by CSIRO’s Dr Katrine Baghurst in her work in the Adelaide aged-care facility. She abolished simple constipation in a matter of weeks by persuading the residents to increase their intake of whole grain and high fibre foods. The effect was so quick and strong that it supplanted the use of laxatives at the nursing home and news of this may have contributed to the community acceptance of cereal grain fibres and the increase in consumption. However following the establishment of a collaboration between CSIRO’s David Topping and the University of Adelaide’s Dr Alan Snoswell in the late 1970s it became clear that there is more to the value of fibre than simple indigestibility. Snoswell was interested in the way sheep used the products of rumen bacterial fibre fermentation. These products (short chain fatty acids, SCFA) give herbivores most of their energy. This contact with Snoswell, led to the realisation that volatile fatty acids were present also in significant amounts in the large bowel of non-herbivorous animals and were formed by the same processes. This led the CSIRO team to suspect that SCFA were the mediators of the beneficial effects of fibre on gut health. They showed that the short chain fatty acids were present also in the large bowel of rats at high levels. Subsequently, they demonstrated that short chain fatty acid levels were also high in the colon of pigs which, with rats, are accepted experimental models for human nutrition and were making a significant metabolic contribution in these non-herbivores raising the question as to the situation in humans. Resistant starch mechanisms. [Source: The BARLEYmax Better Nutrition Report published by the BARLEYmax Joint Venture representing CSIRO and Australian Capital Ventures Ltd, July 2009]. In a collaborative study with the Queen Elizabeth Hospital, Topping and Snoswell showed that quantities of short chain fatty acid (SCFA) were negligible in the small intestine, very high in the mid-colonic stoma and lower in the distal colon and faeces. This pioneering study established the potential for SCFA to contribute to the human host and also a potential role for SCFA in preventing large bowel diseases such as colorectal cancer or ulcerative colitis. The Hungry Microbiome: Resistant starch feeds the beneficial bacteria of the large intestine. This project is part of the VizbiPlus initiative [http://vizbi.org/plus/], which is partially funded by an Inspiring Australia grant from the Australian Government. Topping and his colleagues published a paper laying out this hypothesis in the Medical Journal of Australia (1986). The paper was titled Bacterial Fermentation of the Human Large Bowel: Time to Change from the Roughage Model of Dietary Fibreâ€. These ideas have been accepted widely as has the concept of fermentability, which is the degree and speed with which fibre components are metabolised by the large bowel microbiota. Recognition of the positive contribution of the large and taxonomically diverse microbial colonisation of the large bowel was also a radical change from the perception that gut bacteria were a threat to health and well-being. CSIRO’s insights into the role of fermentable fibre in health outcomes led to the conclusion that the Australian paradox reflected deficient production of SCFA secondary to insufficient substrate for the colonic bacteria ‘ the hungry microbiome. As a part of the rethinking of the role of fibre, CSIRO and partner scientists were major contributors to a redrafting of the definition of dietary fibre to include physiological actions as well as composition and measurement. The major components of fibre were identified as indigestible carbohydrates primarily of plant origin. This revision was a world first and, importantly, the new definition allowed for the inclusion of the synthetic ingredients used by the food industry. Subsequently the researchers established that the individual major short chain fatty acids -acetate, propionate, butyrate – had different metabolic effects and that there were benefits to their specific delivery to the large bowel. They discovered that when acetate, propionate or butyrate were chemically linked to starch (by acylation) it allowed a substantial quantity of the starch to pass through the upper gut to the large bowel where bacterial enzymes broke the ester bond releasing the SCFA with a high degree of specificity. Using this technology they established that butyrate is extremely important for colonic integrity. The first ingredients to deliver SCFA to the colon were Australian native gum tree exudates which are in limited use by the food industry as texturisers and emulsifiers. Pilot animal trials showed that these raised large bowel SCFA significantly but it proved impractical to extract sufficient quantities for large scale production of new foods. The same was true for the residues from fruit juice extraction. These waste streams are high in fibre polysaccharides. Nutritional trials showed that they are extremely effective in raising large bowel SCFA but the tonnage was insufficient to sustain production. A collaborative nutritional study (in pigs) with the HJ Heinz company showed that canned baked (navy) beans had sufficient fermentable substrate to double their effective fibre content. This unmeasured fibre was a form of starch which escaped small intestinal digestion and entered the large bowel where it was digested by the microflora. It was given the name resistant starch. It subsequently emerged that undigested starch was the key contributor to the low incidence of gut health problems in the study of native Africans that led to the development of the fibre hypothesis discussed earlier. Almost universally, starchy foods are cooked to increase their digestibility and palatability through gelatinisation. In modern societies, cooked foods are frequently eaten promptly which is not the case with the Africans. Their staple maize porridge is eaten cold after overnight storage. This leads to retrogradation, a process during which the starch chains reassociate becoming resistant to small intestinal digestion ie resistant starch. This is a form of ‘staling’ that has become almost unknown in Australia. While resistant starch is fermented extensively by the large bowel bacteria, the resulting SCFA profile is particularly beneficial for health outcomes relative to other fibre sources. Starch fermentation favours the production of butyrate, the SCFA that is a preferred substrate for colon cells and helps to maintain a normal colon cell population through a variety of mechanisms. Thus the need for new food ingredients is not simply to enhance short chain fatty acid production but to enhance the production of butyrate. CSIRO’s participation in the Cooperative Research Centre for Food Innovation identified a novel starch which was a candidate fermentable food ingredient. This was a high amylose maize starch called Hi-maize® which exploits the difference between the two major forms of starch ‘ amylose and amylopectin. The latter is a very large, highly branched polymer which gelatinizes readily on heating with water. The disadvantage of amylopectin is that it is very slow to retrograde on cooling. In contrast, amylose is a relatively compact linear polymer which does not gelatinize quickly but retrogrades rapidly forming resistant starch which is not digested in the small intestine. Most commercial starches contain <30% amylose but some maize varieties are high in amylose starch through a genetic modification which increases amylose synthesis at the expense of amylopectin. Nutritional trials with Hi-maize® showed that it was very effective in raising large bowel butyrate in humans and a range of consumer foods were launched using it as a selling point. Unfortunately the starch was owned by an Australian company which was sold to overseas interests, limiting the research and development opportunities for Australia. The fermentable fibre gap was (and remains) a major public health concern as well as a business opportunity for the Agri-food sector. The size of the gap for resistant starch is not certain but, assuming a requirement of 20 g/person/day and current intakes of 2-4 g/person/day, simple arithmetic shows that this equates to >1.4 million tonnes in Australia alone. An opportunity to find new ingredients to fill the gap came from a meeting in 1998 at CSIRO Black Mountain between Drs Jim Peacock and Matthew Morell (Division of Plant Industry) and Tony Bird and David Topping (Division of Human Nutrition), to identify the possibilities for new value-added grains, especially ones high in resistant starch. When the scale of the opportunity was realised, Drs Morell and Peacock looked at each other and said â€œHow about Himalaya 292?â€ The Himalaya barley strain had been studied by Dr Peter Chandler’s group at Plant Industry since the mid 1990s, in recognition of the public health issue around a deficit of resistant starch in the Australian diet. Their focus was on the role of plant hormones in grain development. At the time of the above meeting Himalaya 292 was a research line only and had not been commercially grown for many years. It was stored in a shoe box with some 100 other strains of barley grain. Himalaya 292 seemed the perfect candidate as it produces a shrunken grain, suggesting possible changes in starch composition. The BARLEYmaxTM project officially commenced during the latter part of 1998. The project was undertaken by scientists from CSIRO’s Division of Plant Industry (Canberra) and the Division of Health Science and Nutrition (Adelaide). Plant Industry focussed their attention on genetics and breeding a superior barley grain, while Health Sciences and Nutrition looked for nutritional and clinical evidence to support the new barley grain. A research program was put in place which became the template for substantiating the health attributes of new grains. Step 1 – was analysis of the composition of the new barley. As expected it had a high level of resistant starch but it was also high in total dietary fibre, protein and lipid. The fibre was present as soluble and insoluble non-starch polysaccharides as well as oligosaccharides and there was a significant level of sugars promising good consumer acceptance through taste. Step 2 – After growing sufficient grain, Step 2 was a feeding trial in rats where the new barley was compared with established fibre sources and commercial barley varieties. Rats are a valuable test bed for this comparison as they consume relatively small quantities of food but they are also extremely discriminating and will reject diets which have poor organoleptic properties. The new barley (becoming known as BARLEYmax) performed outstandingly and raised large bowel short chain fatty acids as anticipated with a substantial increase in butyrate over the other diets. Step 3 -The next stage (Step 3) was to grow sufficient barley for a feeding trial in pigs. Pigs are an excellent model for human gut physiology, especially as the animals consume human foods in quantities eaten by people. As is the case for the rat, pigs are also extremely discriminating and acceptance of the new barley was excellent. As in the rat trial, BARLEYmax performed outstandingly giving the confidence to proceed to human studies. BARLEYmax grain. Using traditional plant breeding techniques, CSIRO scientists have developed BARLEYmax®, a new type of barley with significant health benefits. Barley Plus Pty Ltd, which later became Ascentia, was officially established in 2001 to commercialize the BARLEYmaxTM grain, initially in the Division of Plant Industry and later as part of the Food Futures Flagship. Investment for the company was provided by Australian Capital Ventures Ltd (ACVL), and CSIRO with Dr Jim Peacock as Chairman. Additional commercial expertise was provided by Mr Lindsay Adler from CSIRO’s Business Development and Commercial group. The challenges involved in maintaining Ascentia, given the fairly early developmental stage of the BARLEYmaxTM grain, resulted in a decision to wind up the company in 2005. Subsequently an unincorporated joint venture (UJV) involving just two parties ‘ CSIRO and ACVL – was established in June 2005 to ensure the continuation of a commercial path to market for the BARLEYmaxTM grain. In October 2007 positive outcomes were announced following a study undertaken at the CSIRO Human Nutrition Clinic (Adelaide). The outcomes of the clinical testing demonstrated that food products containing the BARLEYmaxTM grain had a low glycaemic index and promoted key indicators of bowel health, especially short chain fatty acid production. Additional phases of testing confirmed the superior health properties associated with BARLEYmaxTM products, as well as highlighting the product’s naturally sweet taste. Following the lengthy testing process, an EOI process resulted, in 2008, in the joint venture licensing Austgrains Pty Ltd to grow, produce and then distribute the BARLEYmaxTM grain in the initial markets to be targeted (Australia and New Zealand). The BARLEYmaxTM UJV and Austgrains relationship was, as Austgrains Managing Director Warren Hannam pointed out a â€œperfect fitâ€. Austgrains had been established in 1971 to capture the rising trend of the healthier consumer opting for premium products offering superior nutritional benefits and was partly owned by Washington H Soul Pattinson and Company Limited. The next key achievement for BARLEYmaxTM was establishing a major licensing arrangement with the brand Goodness Superfoods, manufactured by the Victorian-based company, Popina Foods, a Melbourne-based family-owned business established in 1983. Over time Popina Foods has built a reputation as a health food manufacturer that stocked to major retail players, such as Woolworths, Coles and Franklins. ‘Popinaâ€¦has been a great supporter of BARLEYmaxâ€¦developed an entire brand called Goodness Superfoods around BARLEYmaxâ€. Popina established its own partnerships to further the path to market of the BARLEYmax grainâ€¦.Popina have done a partnership deal with Diabetes Australia Victoria and it’s the only product that’s got all the ticks for Diabetes Australia Victoria’. While Popina Superfoods remains a key manufacturer for the BARLEYmaxTM cereal, the BARLEYmaxTM grain is now being licensed to other manufacturers including Plus Nutrition, Bodhi’s Bakehouse and SunRice. The major manufacturers and products featuring BARLEYmaxTM and retailers stocking the products are illustrated in Table 1. Table 1. Growers, manufacturers, products and retailers involved in the supply chain of BARLEYmaxTM and associated products. One of the key challenges is to increase the volume of production of the BARLEYmaxTM grain. Hand-in-hand with technology refinements are the development of international expansion opportunities for the incorporated entity. These include the expansion of the BARLEYmaxTM concept into South Africa, North America and Europe. There is also a potential move to export the manufactured product into international markets. 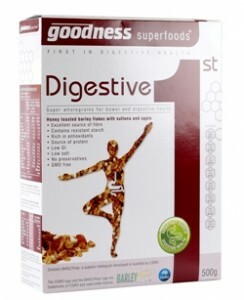 For instance, in September 2013, BARLEYmaxTM‘s Heart 1st and Digestive 1st cereals were launched in New Zealand. Furthermore, Popina have been involved in discussions surrounding the possibility of exporting manufactured Goodness Superfoods products directly to the UK. This has been a strategy Popina have already used for the Japanese market. Japan is a potentially lucrative market since it already has a barley culture. Discussions are underway with potential partners in Japan to explore the possibility of establishing arrangements around growing the grain. In order to grow both domestically and internationally, the decision was made for BARLEYmax Enterprises Pty Ltd to undergo an IPO in 2015. While the move to IPO is hoped to provide the incorporated entity with access to more finance, this will also transform the company yet again and change the ownership structure. BARLEYmax® is an acknowledged success which has had significant impact for the general community, the food industry and also for CSIRO. The visible impact lies in the range of processed foods made with it on sale in supermarkets, some of which have the CSIRO logo on the packet. The grain is protected by a strong patent position plus plant breeders’ rights and the concept is now lodged in a spin-off company, BARLEYmax® Enterprises.